The current Chief Operations Officer and Head of Flight Operations Capt.Druvi Perera of Sri Lankan Airlines has been granted the enviable task of now running the identical functions of Mihin Lanka the low cost budget airline too as now both airlines are being ordered to run under one Chairman but under two separate AOCs issued by the Director General of the Civil Aviation Authority of Sri Lanka. Among many blatant decisions taken in the recent past by the former Sri Lankan Airlines Chairman Nishantha Wickramasinghe and the soon to be out going CEO Kapila Chandrasena, is the controversial appointment of Capt. Druvi Perera to the post he currently holds. It is important to point out that there is ‘NO’ such post as per the legality and as laid down in the Air Operator Certificate (AOC) manual (ref SLCAP 4100 Appendix I dated 16/05/2011 rev 1). The instructions attached here should have been crystal clear especially to those within the aviation sector and of the national carrier. His post of Chief Operating Officer never existed before and was created and advertised in manner that ensured he was the sole applicant for the post. Strangely even the maximum age for this post was highlighted at 50 preventing other suitable candidates from applying. What further shocked aviation professionals in the Flight Operations was firstly here was a Pilot who had only his Australian Ordinary Level qualifications besides his flying credentials and further his ability and skills were questionable after his famous approach and landing incident in Chennai and more famously his push back without obtaining Air Traffic Control clearance with a VVIP on board in late 2014. Since these two incidents were reported by Colombo Telegraph on the 9th and 14th of February 2015 respectively, the national carrier is yet to refute both allegations. Worthy questions been asked now is as to how a person with such track record could be granted more responsibilities when it was commonly known that his controversial appointment and many other dealings is been probed at present at a personal level by Lawyer J.C. Weliamuna and his team. The 100 day programme of the current ruling country’s government made many voters cast their votes in the hope that perpetrators and fraudsters would be brought to task as part of their pre-election promises. The confidence instilled in the people of this country took a positive turn with many eagerly coming forward to name and shame those who have been abusing power and those that have robbed the country. This changed mindset of its people has now granted many the confidence to speak up fearlessly, especially those employees within the national airline. The ongoing probe ordered by the Aviation Ministry has now had employees queuing up Lawyer Weliamuna’s door to blurt out credible information. Information on the national carrier’s misdeeds and fraud now flow freely by those employees who had been muted all this time power wielding Senior Management in control of the airline who have been planted there by the previous regime. Pilot related incidents of Sri Lankan Airlines was exposed by the media which raised questions about certain Pilots who commanded commercially operated flights with actions that compromised the lives of passengers on board. Just five years ago nearly a dozen very senior Sri Lankan pilots who had previously served foreign airlines returned to our shores. They offered their services once again to the national carrier but were cold shouldered by the then Chairman Nishantha Wickremasinghe on the advice of the then Senior Manager Flight Operations for reasons best known to themselves. This was at a time when the national carrier depended on 35% expatriate Captains to fill the void created by many other brilliant Pilots who departed to join various Middle Eastern Airlines in absolute disgust. This took place due to the manner of how the airline was amateurishly been run and especially how they were been treated. The airline was severely short of senior captains on their long haul fleet with flights being cancelled on an adhoc basis. A year later, when these pilots found employment elsewhere the airline lost no time in advertising for pilots, internationally. Several foreign pilots with some holding dead licences were recruited and millions of public money was spent all over again in reactivating their licenses, whereas all of the returning pilots held live or active licences and would not have cost a rupee to the airline. “The cash strapped airline lost more whilst a few got rich in the process. Aren’t these the same people who jumped on the bandwagon and called themselves the patriotic sons of the land ? What humbug !” blurted a Pilot who left to commence a new job in the Arabian Gulf. The two stories carried by Colombo Telegraph which appeared on the days mentioned previously also highlighted Capt.Druvi Perera’s famous safety related incidents when he was in command of those two specific flights that tainted his professionalism and competence as a pilot. Strangely those incidents have up to now never been refuted by the airline providing cause to believe that the airline was found to be guilty due to the actions of Capt.Druvi Perera. What is now interesting to find out is if the Civil Aviation Authority headed by Director General Nimalsiri was forced to hush these two incidents by people in higher power. Under Capt. Druvi Perera’s astute leadership is also the famous incident where he succumbed to the political pressures which was wielded, requesting him to reduce the pass mark in order to accommodate and recruit two potential cadet pilots. One been a boy and the other been a girl. The Chief Pilot Training and Standards at that time Capt.Patrick Fernando and his deputy Capt. Ranga Amadoruwa both stepped down from the post in sheer disgust not wanting to compromise their ethical standards and especially compromising the responsibilities that they were entrusted with holding their posts. 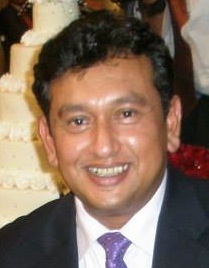 It is worthy to mention that Sri Lankan Airlines has always had political pressures of this nature exerted, however in Capt.Druvi Perera’s case, his passiveness to meekly give in tarnished his reputation among the entire pilot community when he requested of this special favour to accommodate the two cadet pilots short comings at the exam. Further under his directive a foreign company was introduced to assist with the recruitment of cadet pilots when a tried, tested and proven system the airline had in house and run by their very own senior pilots for over 15 years was changed at a very considerable cost. This new recruitment process perhaps has been one of the contributing reasons as to why certain pilots have been acting as ‘cow boys’ in the flight deck instead of respecting and not jeopardizing the human lives which was placed in the trust of their ability when operating commercial flights. Capt. Perera has now incidentally started off on a wrong note with the low cost carrier Mihin Lanka when he served the Safety Manager Capt. Charles Sirimanne a letter dated 16th February 2015 stating that he no longer holds the post he diligently served on a voluntary basis. Strangely the organisational chart and reporting lines do not permit the COO Capt. 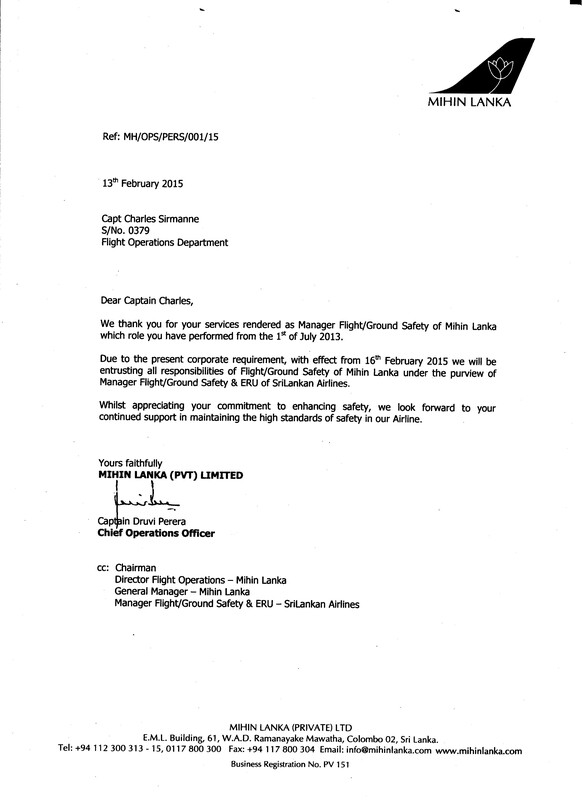 Perera any business to serve this sort of letter to the Manager Safety at Mihin Lanka when it should be have been served by the latter’s direct boss the CEO and that too in consultation and after approval of the Director General Civil Aviation. What appears now is that Capt. Druvi Perera has clearly overstepped his authority in a clear ‘abuse of power’ and in sheer haste to cover up a more sinister and corrupt practice that is being conducted by the Director Flight Operations Capt Pujitha Jayakody, the Chief Pilot Training and Standards of Mihin Lanka. The issue at hand here at Mihin Lanka is the sudden recruitment of foreign trainee pilots violating existing local regulations when plenty of local pilots were more than ready to contribute heavily to hold this dubious honour. There was no transparency in their selection process and very few within the airline knew they had landed. Was this Capt. Druvi Perera’s strategy and meanness in punishing Capt.Sirimanne for this standing in the way of Capt.Jayakody ? An even greater question asked now is has Capt. 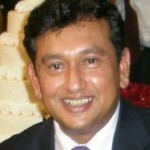 Druvi Perera now assumed the role of Chief Executive Officer of Mihin Lanka? especially after he has now clearly stepped over the boundary by serving Capt. Sirimanne this letter through sheer ignorance and made an utter mess of himself and those even copied on the letter. If this is not a clear abuse of power then it would be interesting to find out what the real definition it is. 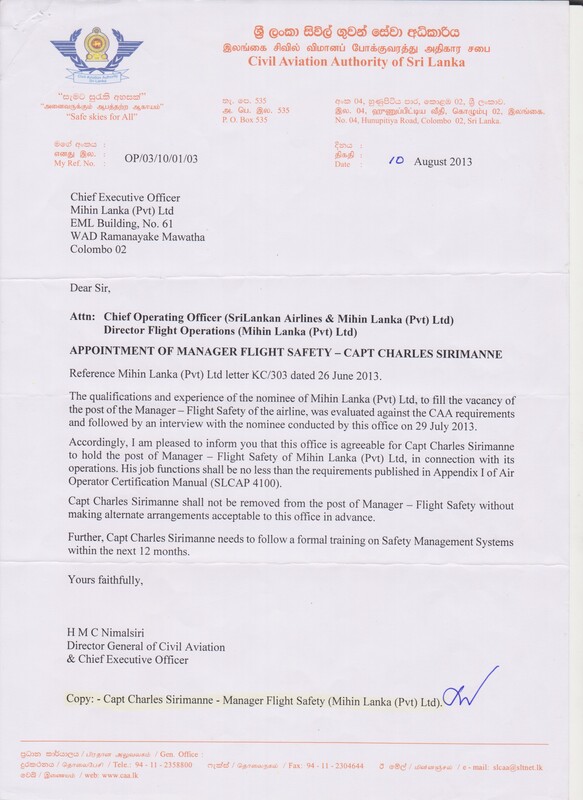 As far as the Civil Aviation Authority and the letter served by Director General H.M.C.Nimalasiri is concerned, Capt.Sirimanne will continue remain as the Manager Safety of Mihin Lanka. 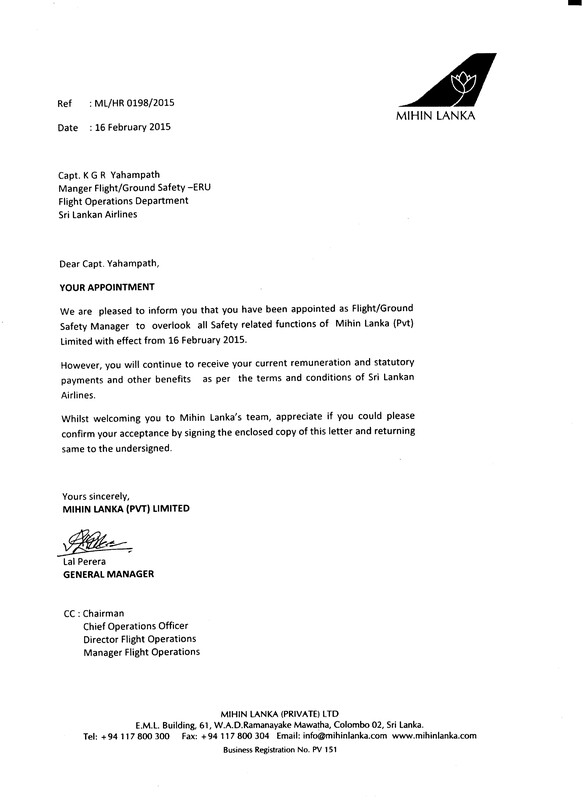 What baffles most is the absolute ignorance also of Lal Perera the newly appointed General Manager of Mihin Lanka went on to issue a letter to Capt.K.G.R.Yahampath of Sri Lankan Airlines informing him that he will be assuming Capt.Charles Sirimanne’s duties at Mihin Lanka on the same day which was 16th February 2015. The real question asked now is as of the 16th February 2015 who really officially holds the post of Safety Manager Mihin Lanka? Colombo Telegraph has also obtained credible information which highlights a safety related issue at Mihin Lanka which otherwise has an unblemished record spanning seven years since it’s relaunch that would have any airline enthusiast read with much interest. That story too would be published by Colombo Telegraph in the near future. The experience of the Captain on that particular flight operated out of Colombo and destined for Jakarta returned back to base an hour and a half after take off that saved the lives of passengers and saved day for the Mihin Lanka on the 20th December 2014. In this instance the management of Mihin Lanka may be fighting shy of thanking the said pilot to date for an excellent job done and saving the image of the airline. This hair raising experience should have been shared with the pilots of their partner Sri Lankan airlines at the least, as is done in aviation all over the world but then the man Capt Perera monitoring both Flight Operations Department hadn’t bothered to do so even though two months have now lapsed after the incident. The critical and valid question asked now is how safe are the country’s national carrier and its low cost carrier as long as Capt.Druvi Perera is at the helm operationally and more importantly holding the throttles of both airlines? « What Is A Nation? How Different Is It From Nation-State?